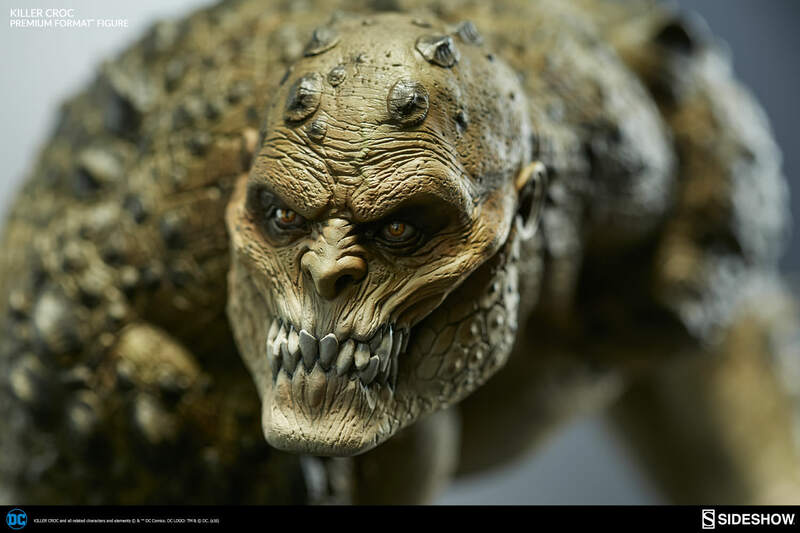 Sideshow Collectibles has revealed their coming Killer Croc Premium Format Figure and I will now give my initial thoughts on this piece based on the material currently available. This should not be considered a review, but rather as my first impression of the piece. 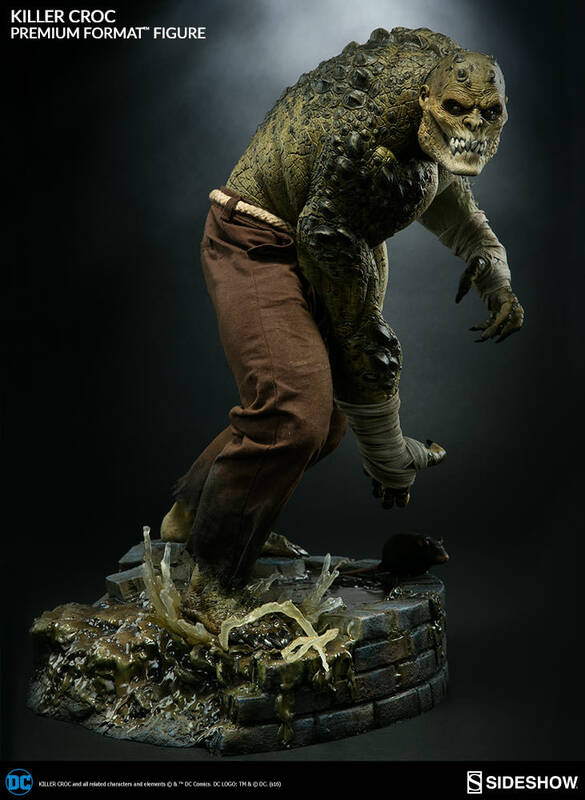 Killer Croc… One of Batman’s most horrifying foes is finally being realized as a 1/4 scale Premium Format by Sideshow Collectibles. Fans have been waiting for this to happen for a very long time. 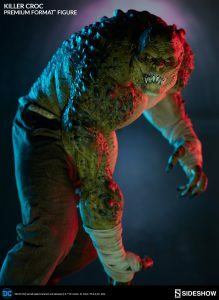 Killer Croc is probably one of the most visually astounding characters that Batman has faced off with over the years. This only makes this upcoming statue from Sideshow all the more interesting to have a closer look at. 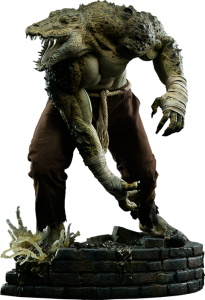 Killer Croc is an unusual villain within the Batman lore with his supernatural and monstrous appearance. He has always creeped me out a bit, and I can easily recall playing Arkham Asylum, running for my life from this frightening character. 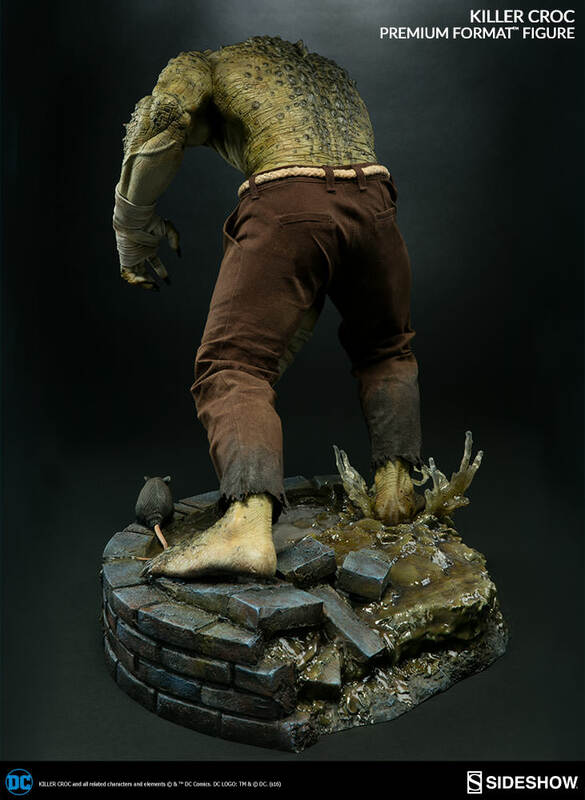 Anyways, let’s dive right in and have a closer look at this new statue by Sideshow Collectibles. The statue was sculpted by Pablo Viggiano and Alfred Paredes. Mold and cast was done by Adam Smith. The paint was done by Steve Riojas and Kat Sapene. Finally, the costume was done by Tim Hanson. One of the most striking elements to this statue is definitely the impressive sculpt. 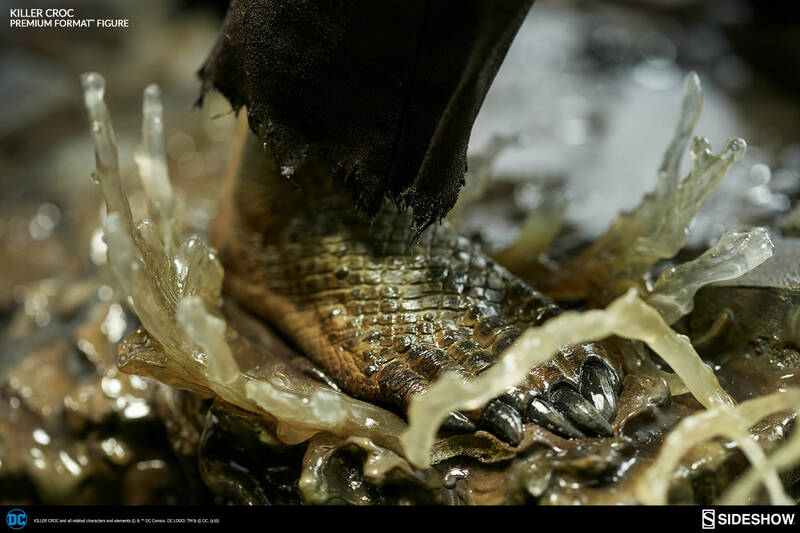 The entire body of Killer Croc is covered by this reptilian skin that looks stunning. It actually looks very realistic with the scales and the nuances in color across the entire back-side of the body. 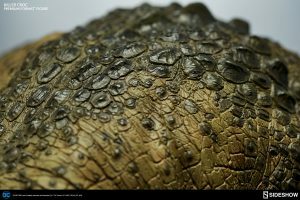 All over the body you also find these larger protruding patches of scale and almost spikes. It honestly looks quite nasty, but that is certainly also the purpose of these details – to give you an uneasy feeling that this is a creature that enjoys long evening walks along the sewage channels and isn’t much for the company of others. The high level of detail can also be detected on the portraits that come with this statue (one regular and one with the exclusive). 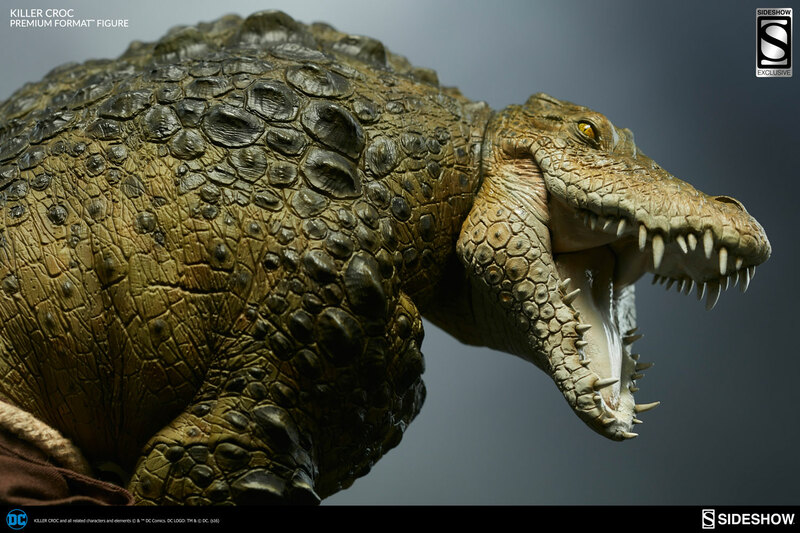 On the regular head, the teeth stand out as a frightening sight, indeed. 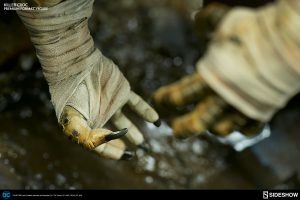 They lock together in a tight and somewhat grotesque way that manages to convey his carnivorous qualities to say the least. His sunken cheeks, rugged and wrinkled skin and wild eyes perfectly unite the human and reptilian features into one single monstrosity. In other words, he’s a thing of pure beauty! 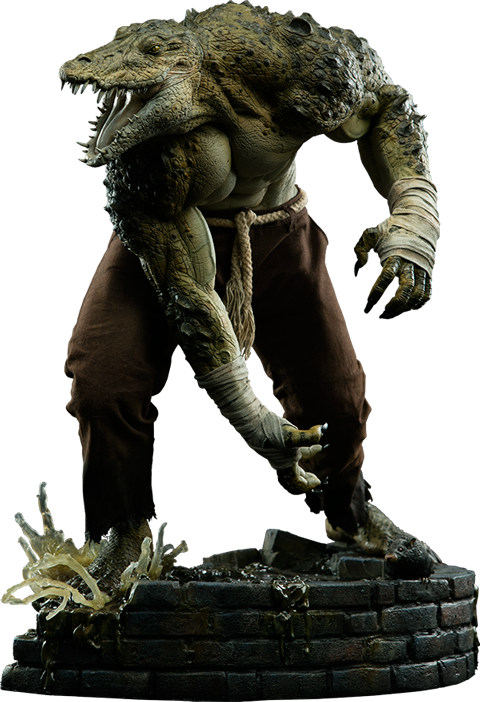 This is a Premium Format statue in its original meaning i.e. fabric parts are present on this statue. 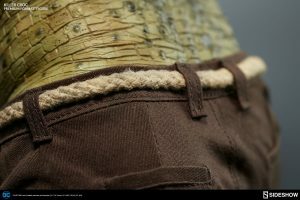 However, being comprised of just the pants and the rope around his waist, the fabric addition to this statue is relatively simple. In that regard there isn’t much to comment on either. 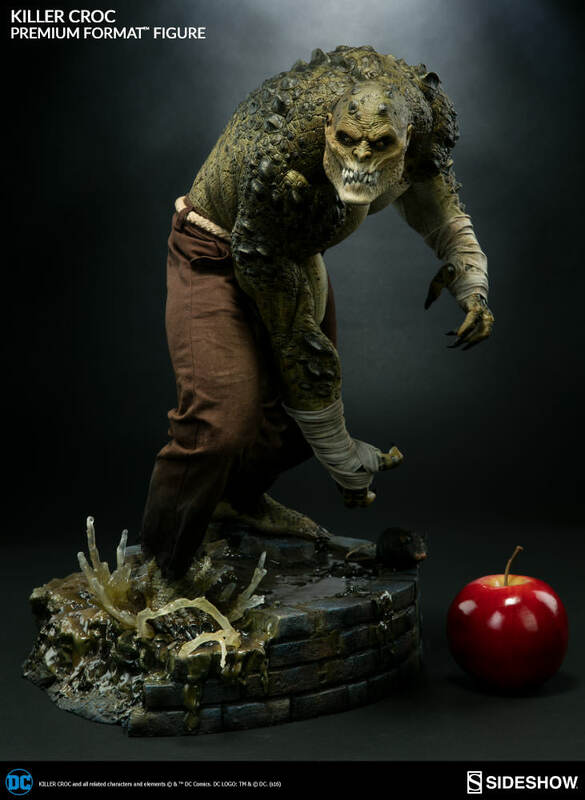 It looks convincing on the statue, and adds a very nice organic feel to the overall impression that you get from this statue. 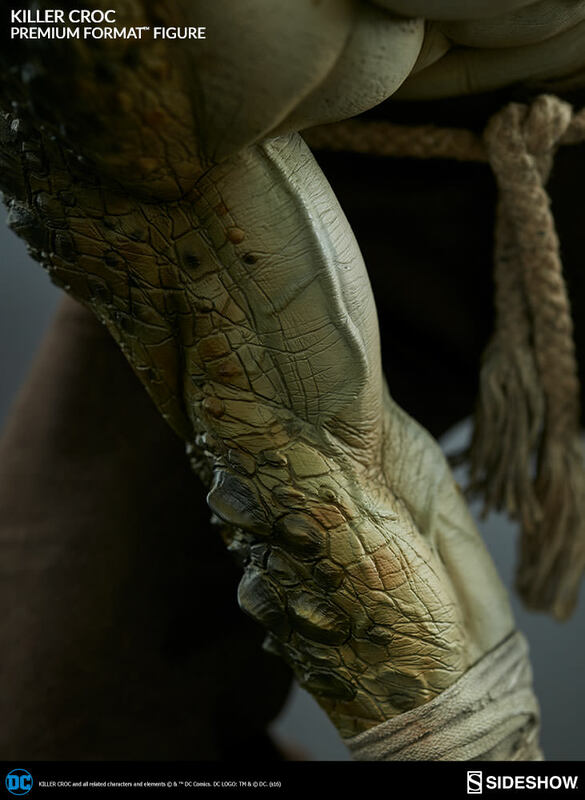 The details on the pants are of course of a high quality, and the costumes department at Sideshow once again prove their amazing talent. 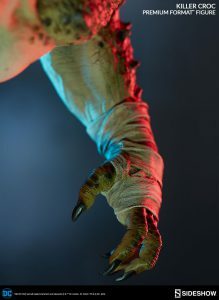 The bandages or wraps that Killer Croc has around his hands (or claws) are sculpted, from what I can tell. 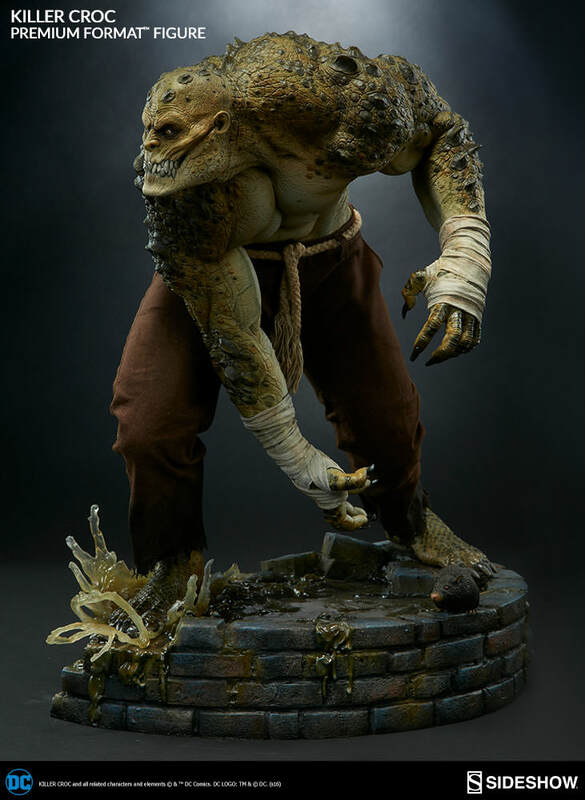 Overall, to me, the sculpt is one of the absolute strongest selling points of this statue. 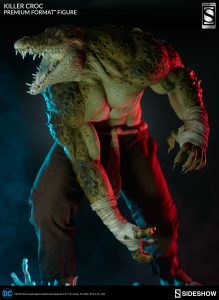 Sideshow has done a marvelous job in creating a terrifying and rather realistic looking Killer Croc. I’m deeply impressed with this since this is one of the few characters that my mind has a hard time imagining. Let’s talk a bit about the pose. You see, I am a bit divided when it comes to the pose here. Let me raise two main points. The first thing is the fact that this is an odd mix between a static and dynamic pose. Most aspects of this statue tell me that this is a static pose. However, the right foot of Killer Croc is splashing up sewer water which adds motion to the overall expression of the statue. This is somewhat conflicting since I generally find the pose of him to be standing still. I also really like the idea of him just standing there, looking ahead. 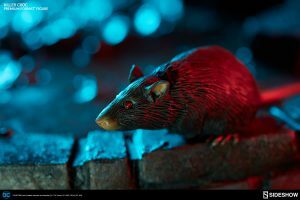 I can just imagine him standing in a sewer tunnel, covered in shadow, and sporting that exact pose. They could have made the splashing effect an optional extra to the piece so that the piece could be displayed with or without it. Well, that’s just my thoughts, anyways. The second thing about the pose that distracts me is the slight leaning that I can detect from some angles. This can be related to this “dynamic pose” quality of the piece, but to me it gets a bit distracting. I think it is in part caused by the fact that his right arm is hanging downwards in front of his torso and leg. Without the lean, there simply wouldn’t be room for it to hang downwards like that. It would be difficult to remedy this without changing the overall feel of the statue, but it would have been to my preference if they had put the right arm to the right of his leg, and thereby shifted his weight more towards the center of the base. 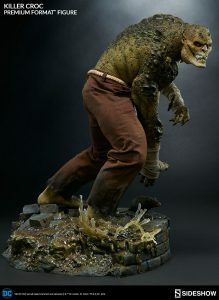 He would look less hunched and creepy, but the trade-off would have been a more cool and Hulk-like pose. One can then argue the pros and cons of that. I just really like it when the weight of a statue is around the center of the piece. I do like the concept of the pose, though. It’s not that I don’t get it. Not at all. It manages to convey the character and his animalistic qualities very well. That’s easy. It’s a must! I almost always feel like this if/when the exclusive is comprised of an alternate portrait. It just gives you almost two statues for the price of one… almost. That says a lot these days too, with the “evolution” of statue pricing! Seriously, though, the exclusive portrait looks amazing. The details and the sculpt in general is just so well made. 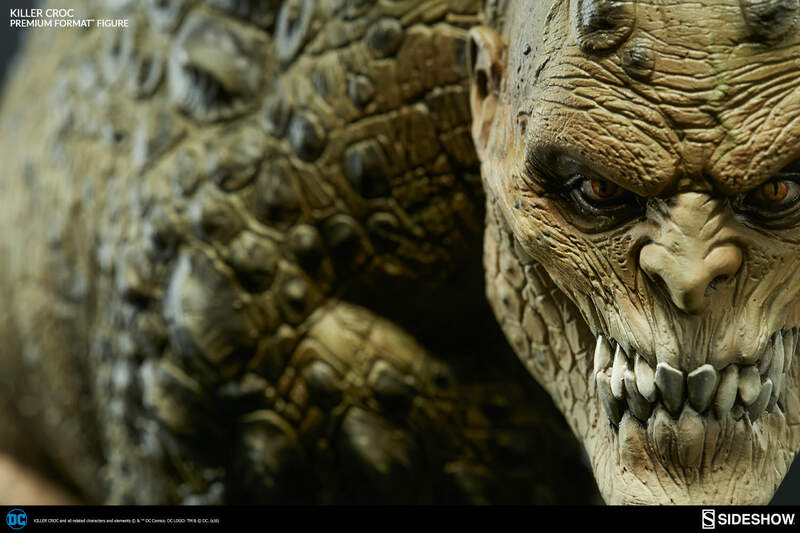 It gives the piece an entirely different look, and makes Killer Croc look even more… crocier! I love it! Hopefully, the seam lines will be, well, seamless. I would prefer not having another Hulk PF situation here. I hope that Sideshow won’t make such a blunder again. 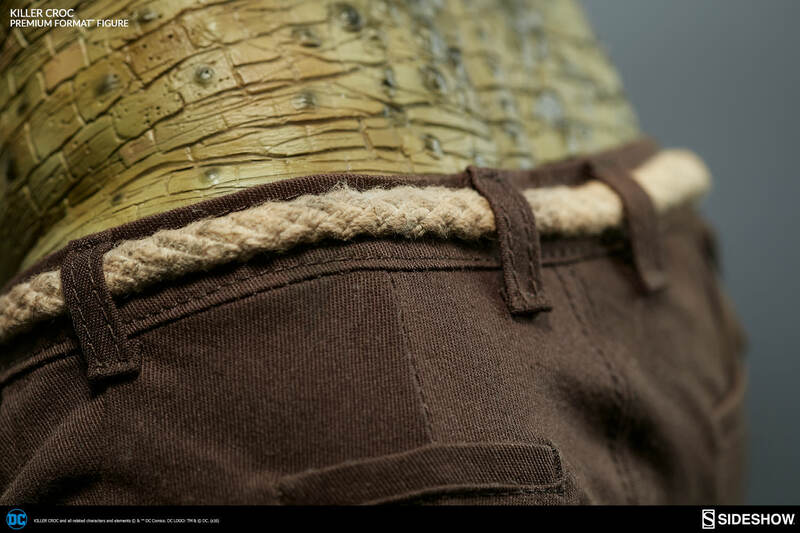 From the photos, it does seem like the seam is very well hidden as part of the sculpt. It’s a good base. It continues the theme of the character, and frames him quite well. The details and the paint seem to be spot on. Again, I don’t really like the splashing water. I don’t feel that it adds more than it takes away from the statue. It just seems like an unnecessary over-complication of the base. I like the glossy effect on the water, which makes it look very realistic. I generally feel positive about this piece. 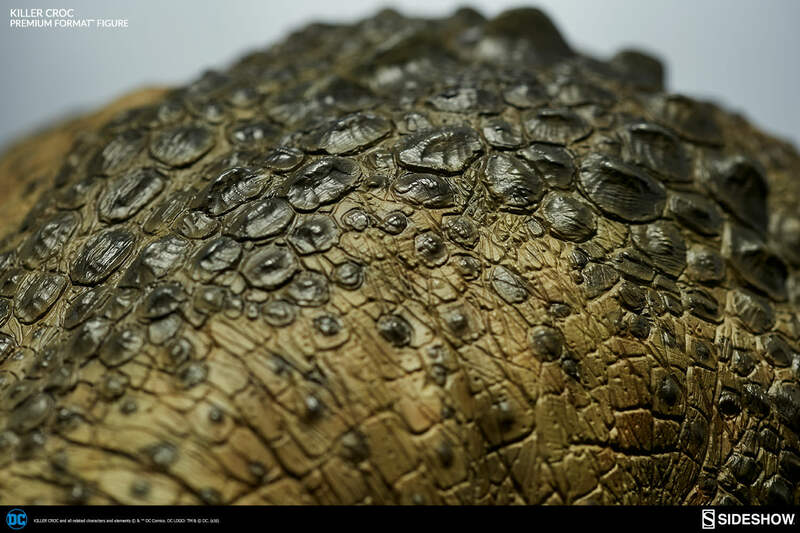 I can appreciate the details of the sculpt and the craftsmanship that went into creating this piece. I wouldn’t say that this is a piece that will find its way into my personal collection, however. I simply don’t feel that it would fit that well in, and I don’t know the character well enough. The statue is “only” 18.5″ tall. 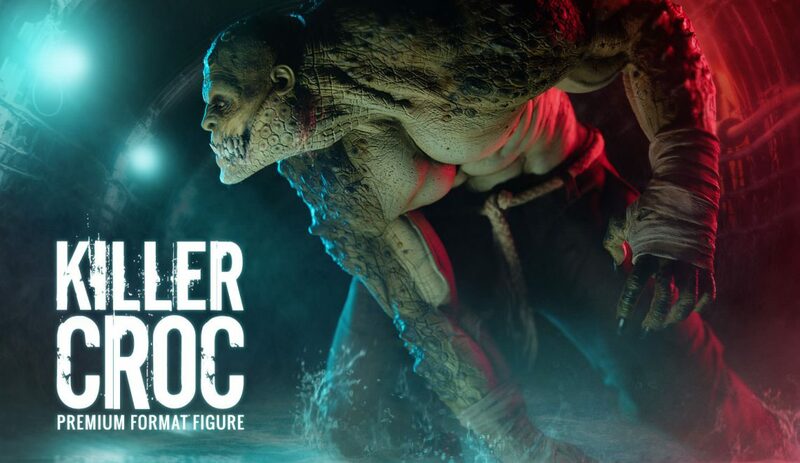 I’ve always imagined that Killer Croc is a huge monstrosity, but it would seem like this statue is not going to tower the current collection of Batman statues from Sideshow. 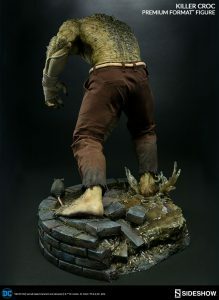 This is of course due to the fact that he is hunched and that the base is not really that tall. The physique of this piece seems to be just the proper size. 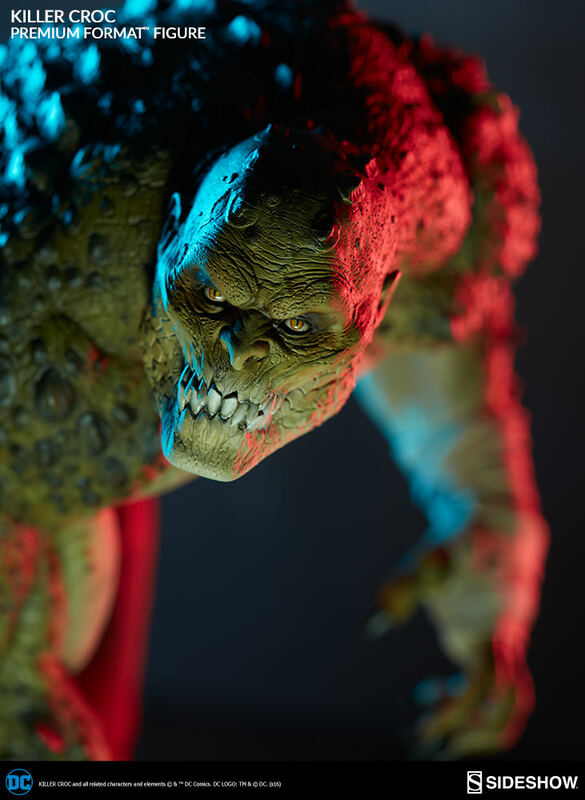 But I will reserve my final judgement on this until the time comes when collectors will be sharing photos of this beast next to the other Batman/DC Premium Format statues. I’m certainly looking forward to that. The truth is that size does matter when it comes to statues. At least, that is something I’m quite convinced holds true when it comes to most 1/4-scale and 1/3-scale collectors (which is basically the same crowd of people these days). Many other companies are coming out with huge and visually/conceptually very impressive statues. 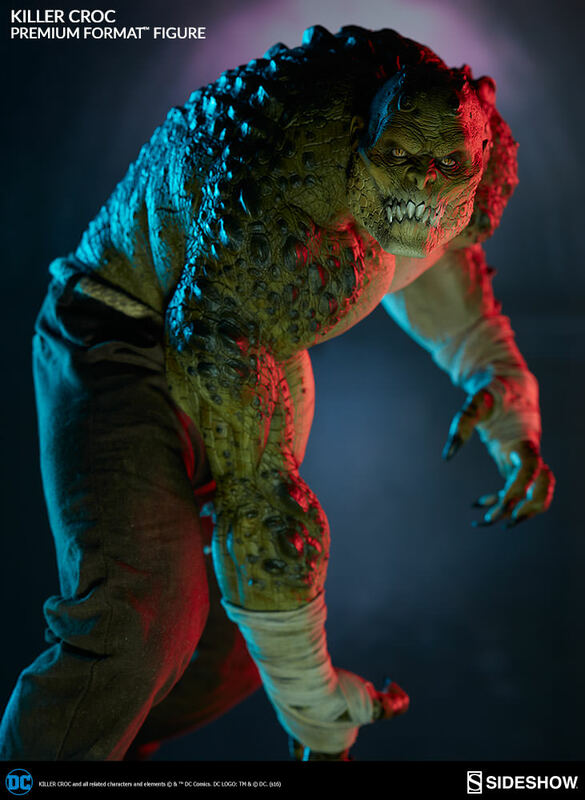 It would have been great to see Killer Croc display his grandiose size in an even more spectacular way. Of course, this needs to be weighed up against the fact that many collectors simply don’t have the space. 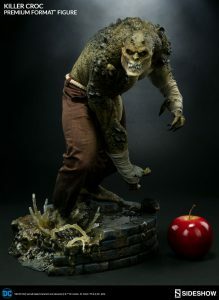 If I was seriously looking to get this statue myself, I’m sure I would be way less eager to call for a larger piece. I’d need him to fit into a Besta after all. Oh, the duality of life! So, what about the price then? Well, not surprisingly, the price is higher than “average”. But these days, there hardly exists an “average” price because of the constant increment in prices that we are constantly seeing now. I honestly feel that the price is too high. I think my pain threshold is at around $500 max. I understand that this piece is “bigger” in a way, but I don’t feel that the overall appearance of this statue explains the higher price. But as I said, I’m really not surprised. 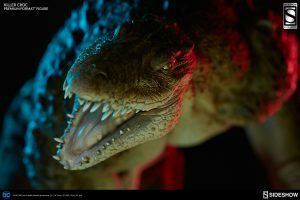 It would be nice if Sideshow could be a little more engaging and maybe be open as to why the prices are spiraling upwards at this rapid speed we are seeing. That basically wraps up my preview of this statue. 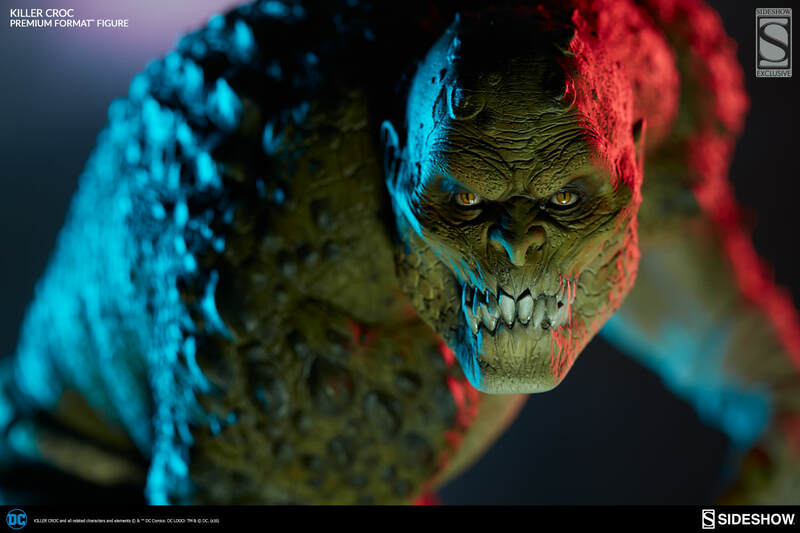 To sum it up very briefly: I like the level of detail and the sculpt here a lot! I don’t know the character enough to warrant a purchase from me. The price is a monstrosity, so I guess it fits well with the statue. 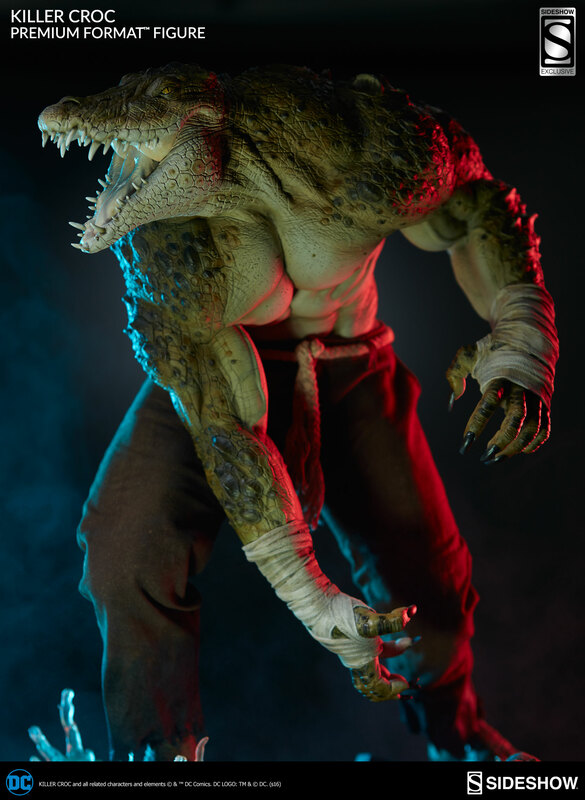 I think die-hard fans of Killer Croc are lucky to get this rendition of the character. So, are you getting this piece? Do you love it or hate it? Leave me a comment and let me know! I also think that this has way more detail than Kylo Ren. I don’t understand their pricing at all. GREED!!! It sure does. But Kylo Ren is heavy on fabric parts, which is, I would assume, also costly to develop. I’m good, by the way. Thank you!